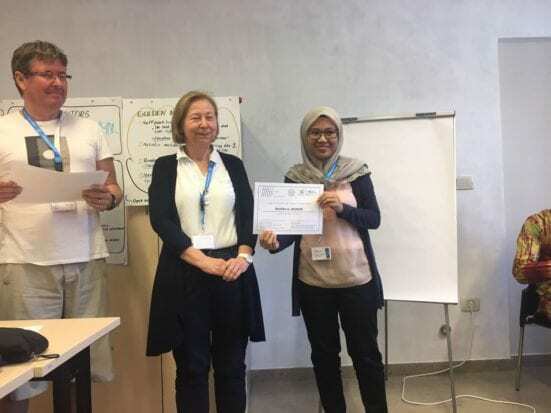 Slovenia, 2 July 2018 – Dr. Nurbiha A Shukor, the UTM Open Education Resource Manager from UTMLead has volunteered to be one of the mentors and was selected among 12 other mentors for the Open Education for Better World Project (OE4BW). The OE4BW is initiated by UNESCO to support Sustainable Development Goal (SDG) number 4 which is to provide Quality Education for better world. This project gathers applicants who want to develop open education resources and who need mentors to assist the development of OER. UTM is the only representative from Malaysia to be the volunteered mentor for the project. Among other countries in the project include Brazil, China, Former Yugoslav Republic of Macedonia, Ecuador, Ethiopia, France, India, Nigeria, Malawi, Mauritius, Netherlands, Peru, Romania, Slovenia, South Africa, Spain, Taiwan, United Kingdom, Canada, Fiji, India, Italy, Kenya, Liberia, Nigeria, South Africa, USA and Uzbekistan. The project ran from January until July 2018. During this period, the mentees and mentors met online through Skype to discuss the proposed project that the mentees would like to develop. Dr Nurbiha’s project was about developing Open Education Resources for Statistics and Probability for Asia Pacific with her mentee Bibhya Sharma from Fiji. Moreover, on 2nd until 7th July 2018, all the mentees and mentors were invited and gathered for the first time to meet face-to-face at University of Nova Gorica, Vipava, Slovenia and undergone a series of workshop on developing OER and to present their proposed project to the organizing committee and all the project members. The same project will open another round of application in 2019 which aims at inviting more applicants and more OER projects to support SDG 4 of UNESCO.